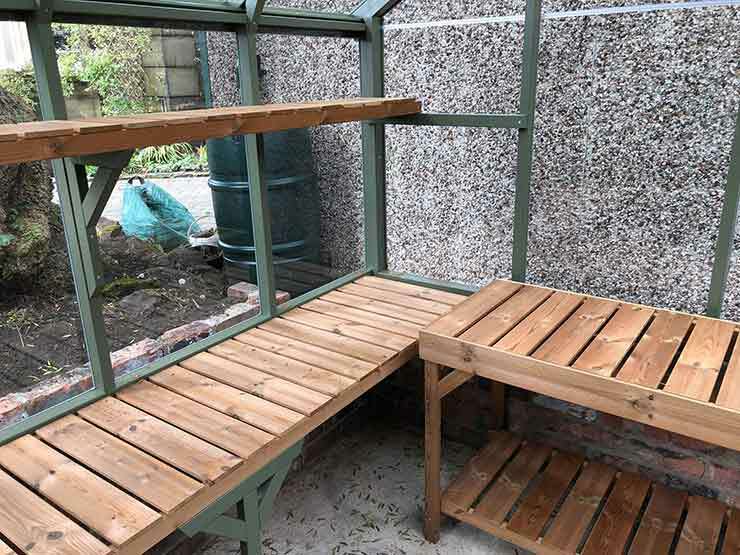 Have us build you a bespoke greenhouse in your choice of materials, colours and dimensions. As builder’s in Halifax we have built quite a few greenhouses over the years and now offer bespoke greenhouse builds as a service. Whether you’re new to greenhouses, have had them in the past or already have one you simply want replaced, H.b.m Builders can build a greenhouse that will not only suit your budget, your taste and your space but will also last decades. 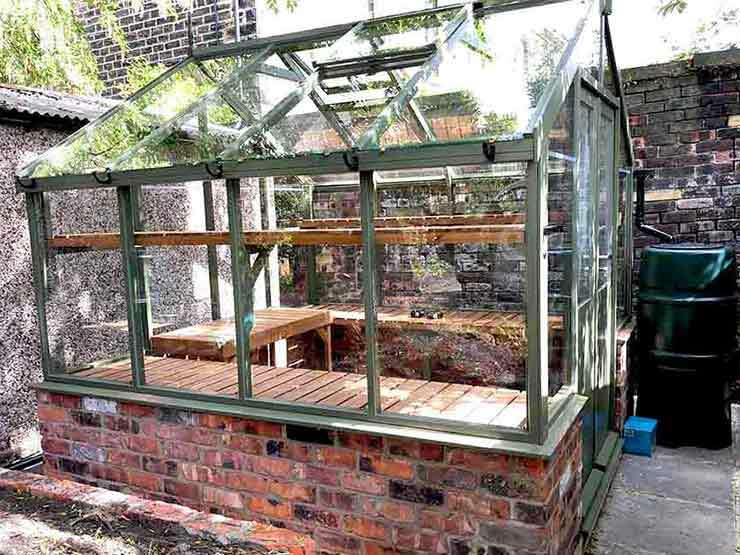 You can have the base for your greenhouse built with reclaimed bricks or new materials of your choice, have paving slabs or block paving for paths and we offer high end oak frames with toughened glass. One of the first things to think about when choosing to have a greenhouse is what type to have. There are less expensive models with light and cheaper frames, plastic sheets instead of glass and are easy to assemble yourself but will it last many years? Paying more money at the start can save you a lot of cost in maintenance over the years, if you are intending to get a long use out of it then it is best to invest in one that will last. 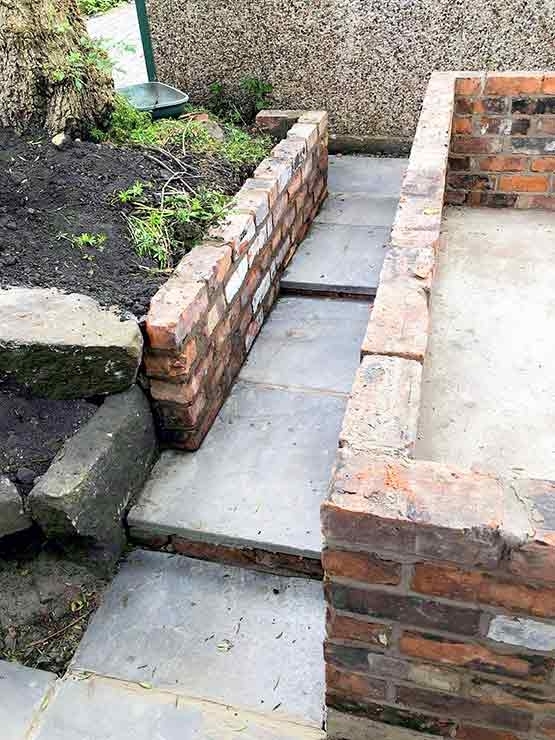 Another thing to consider is where to position it, if you have a few spaces to choose from then you want one that is not always going to be in shade, has easy access (or can easily have paths built to give access) and, to make things easier for you, not too far from the house if you are to run water and electricity from there. Though there may be times you are limited in space and only have one particular area it could be built. 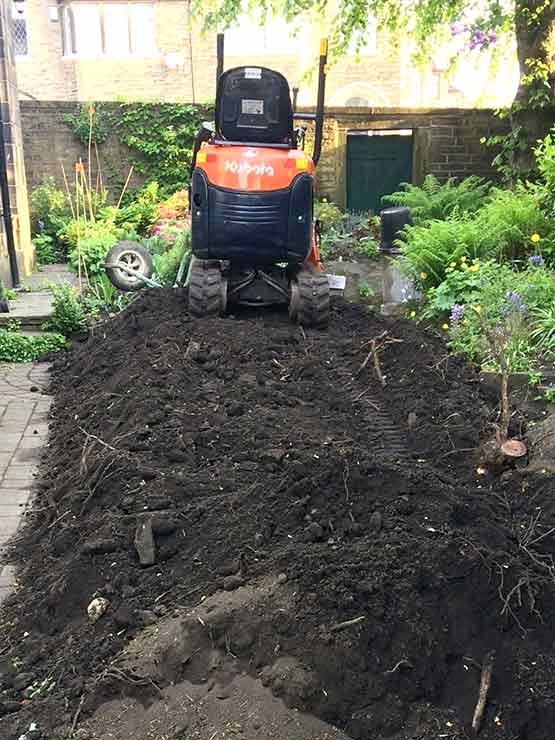 Once the position has been chosen the ground needs to be prepared for the building of the foundation, where needed we can bring in some heavy machinery. Your greenhouse should have a well constructed and solid foundation, unless you intend to grow in the ground, in the greenhouse floor area. 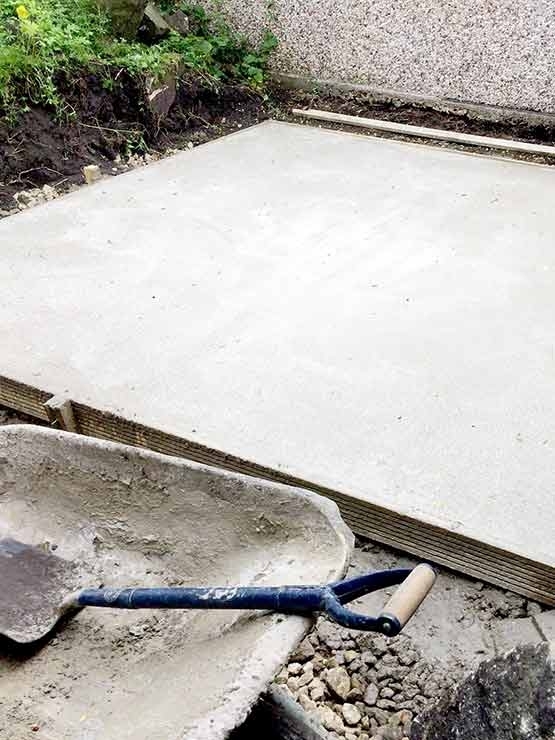 There are several materials you could use to get a solid base, we recommend and sold and level concrete base. 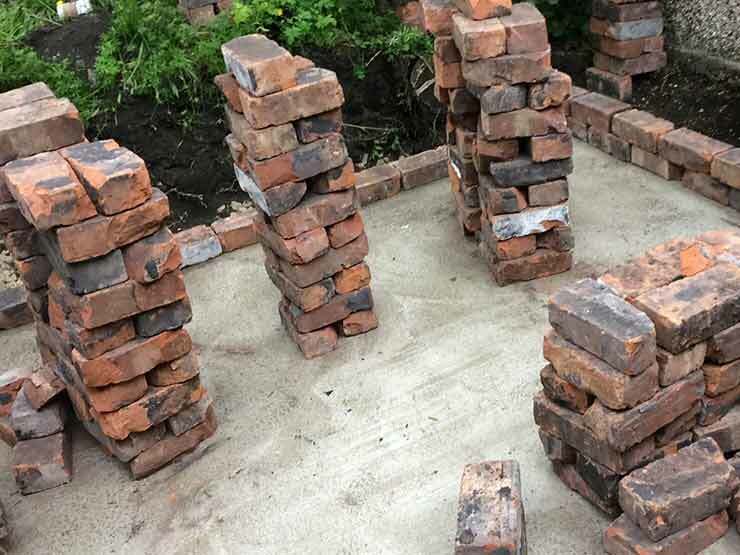 As mentioned before, your greenhouse should have a well constructed and solid foundation. 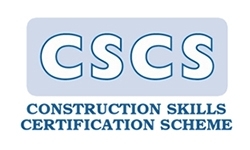 You can also choose to have a base built of bricks or stones and even rendered, roughcast or pebbledashed. 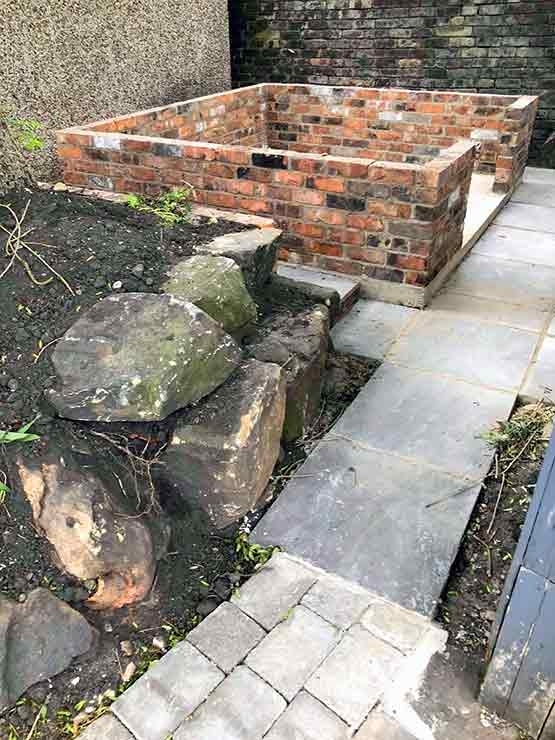 If you’re looking to save a little money you can get a very nice look at the same time by using reclaimed materials such as the reclaimed bricks we used for a previous greenhouse build. 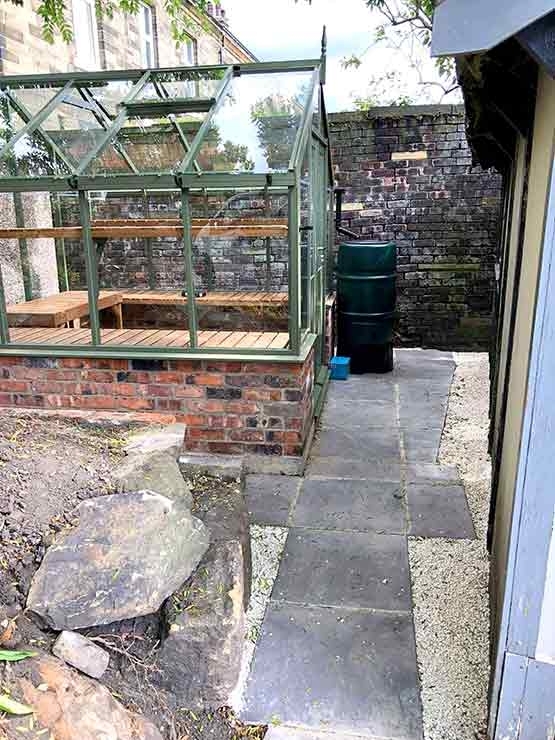 To give easy access from the house to your greenhouse you can have us build paths from stone slabbing, blocks or any paving you choose to have in any colours. 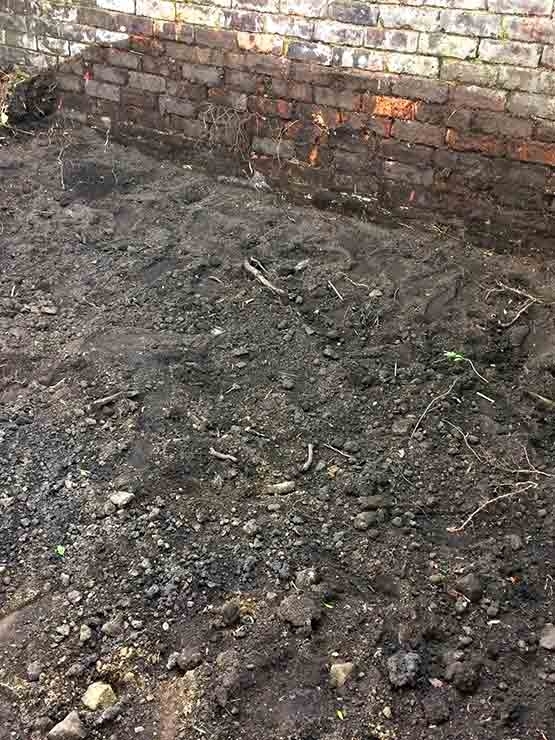 If you already have paths we can try to source the same type of blocks or slabs to fit in with the old. We use several suppliers to the trade and can source a wide variation of colours and styles for any path work required. We strongly recommend high end oak timber frames, which you can have installed when hiring H.b.m Builders. 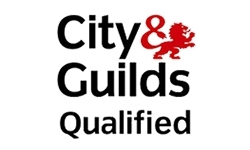 Coming with a 10 year guarantee, you can choose from various designs and colours. You can also have the frame made to measure so it can fit the exact spot you have in mind for it. 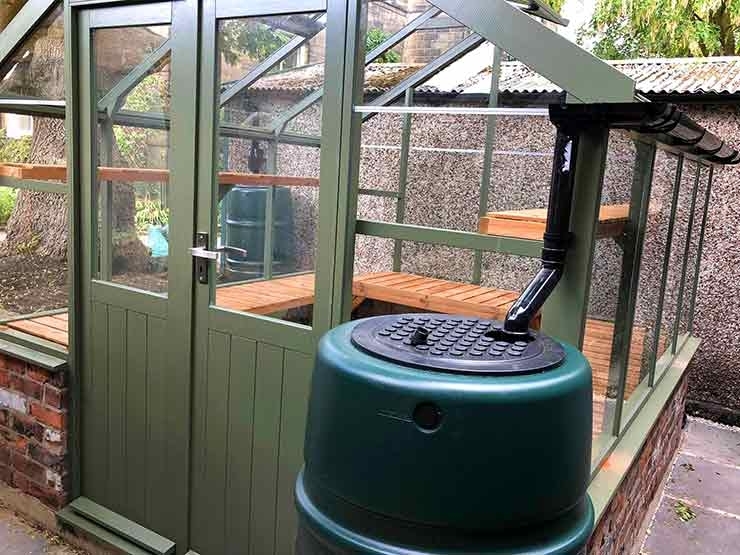 Fitted with toughened glass, having strong oak frames, a solid foundation and base our greenhouses can be a long term investment. 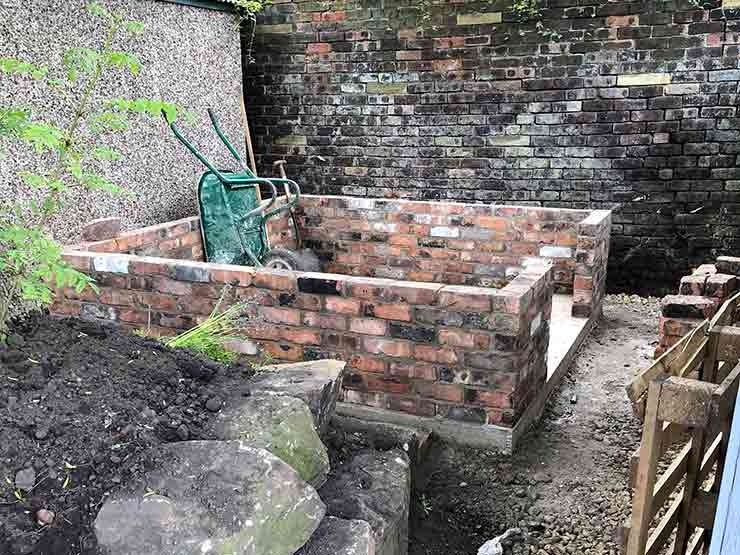 Whether you’re planning on growing your own fruit and veg for consumption or just wanting to potter around with plants, H.b.m Builders can build you the greenhouse you want and need. As with anything you grow in your garden, anything you grow in your greenhouse will need watering. Unlike anything you grow in your garden, what you grow in your greenhouse won’t get the benefit of being watered anytime it rains, or maybe it can? 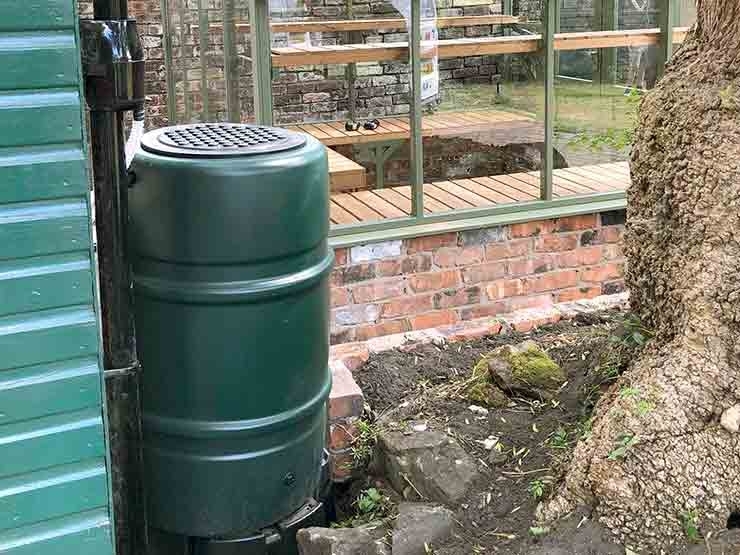 You can have us install an irrigation system in which water can be gathered from a sloping roof, into a drainpipe, then fed into a barrel for storage. Easily double your water gathering and storage by having a second barrel installed for any nearby sheds or other drainpipes. Of course you’ll still need to do the actual watering yourself, but having these little reservoirs of water, on tap and right by the greenhouse makes things so much easier.